The Malayan tapir, Tapirus indicus, is the largest of the extant tapirs, and is the only remaining species of tapir in the Old World. It was first described by Western science in 1819, and is still occasionally referred to by its original scientific name Acrocodia indica. As further genetic research continues, its place relative to other species continues to be debated. The Malayan tapir has a distinctive black and white colouration which apparently breaks up the outline of the body in the gloom of the forests in which it lives. They have have a stubby, vestigial tail, and like all other species of tapir, have a flexible proboscis and four hooves on front feet and three hooves on rear feet. Malayan tapirs grow to between 1.8 and 2.5 m in length, and stand 90 to 110 cm tall. They typically weigh between 250 and 320 kg, although some adults can weigh up to 540 kg. The females are usually larger than the males. 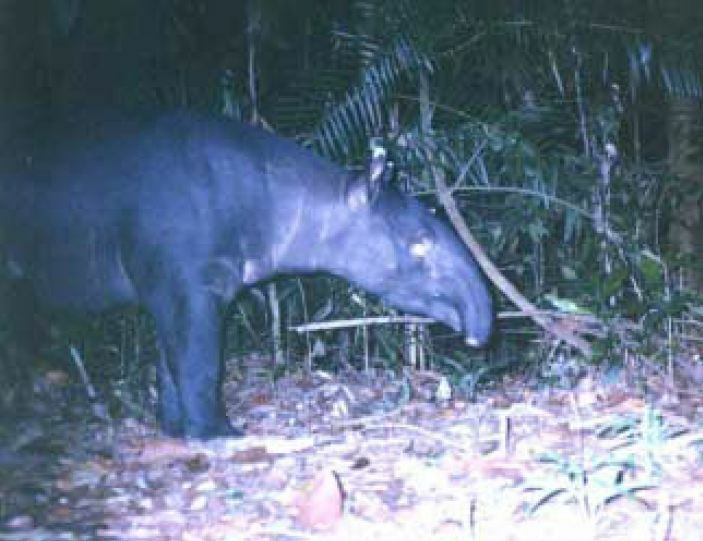 In the 1920s, two all-black Malayan tapirs were sent to the Rotterdam Zoo, and in 2000, a camera trap in Malaysia also captured an image of a tapir without the white marking. They were dubbed "Brevet tapirs" (Tapirus indicus brevetianus), named after the person who captured the first one, although it is likely to be only a genetic variation, rather than a distinct subspecies. Malayan tapirs live in southern and central parts of Sumatra (Indonesia), and on the Asian mainland in Peninsular Malaysia, Thailand and Myanmar (south of latitude 18°N). Its populations are now highly fragmented within its former range. It was listed as occurring in southern Cambodia and possibly southern Viet Nam, and unconfirmed reports from the early 20th century in Laos, southern China and Borneo, but is presumed to be extinct in these countries (if it ever existed in recent times in them). The Malayan tapir was first listed as endangered in 1986, due to an ongoing decline from loss of available habitat, fragmentation of remaining habitat and increasingly hunting pressure. Population declines are estimated to be greater than 50% in the past 3 generation (36 years) driven primarily by large scale conversion of tapir habitat to palm oil plantations and other human dominated land use. Remaining populations are isolated in existing protected areas and forest fragments. This situation is expected to continue at a slightly diminishing rate in the future as non-protected areas, which are available as logging concessions, become less available. Hunting of Malayan tapirs is increasing throughout the range, which could be cause for concern in the future as already reduced and isolated sub-populations would be at a greater risk for local extinction.